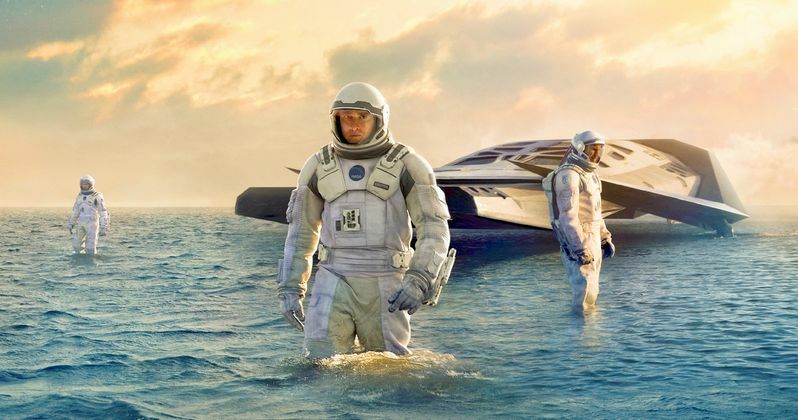 GIVEAWAY: Win an Interstellar Blu-ray Prize Pack! After taking in a whopping $672 million in theaters worldwide last year, director Christopher Nolan's awe-inspiring sci-fi thriller Interstellar debuts on Blu-ray and DVD today from Paramount Home Media Distribution. Fans can experience this blockbuster from the comfort of their own home with the Blu-ray and DVD release, plus go behind-the-scenes of Interstellar with an extensive amount of special features. We know you won't want to miss this immersive home media experience, so we have a contest lined up where fans can take home an Interstellar tote bag, t-shirt and a copy of the Blu-ray. A breathtaking filmmaking achievement, Interstellar has been named one of the Top Ten movies of the year by Rolling Stone, Esquire, the New York Post and more, and has received five Academy Award nominations including Best Visual Effects, Best Production Design, Best Sound Mixing, Best Sound Editing and Best Original Score. Academy Award-winner Matthew McConaughey stars as ex-pilot-turned-farmer Cooper, who must leave his family and a foundering Earth behind to lead an expedition traveling beyond this galaxy to discover whether mankind has a future among the stars. The film also stars Academy Award-winners Anne Hathaway and Michael Caine and Academy Award-nominees Jessica Chastain and John Lithgow. Interstellar will be available in a three-disc Blu-ray Combo Pack with UltraViolet and three hours of in-depth, behind-the-scenes bonus content detailing the epic shoot, the scientific realities explored in the film, a look at creating the stunning visuals, plus an extended cut of "The Science of Interstellar" broadcast special and much more. For a limited time, the Blu-ray Combo Pack will also include an authentic, collectible Interstellar film cell from an original 70MM IMAX print of the film. In addition, fans can also visit InterstellarMovie.com/Adventure to check out the Interstellar Text Adventure Game, where fans can play as one of the twelve Lazarus Mission astronauts sent through the wormhole ten years prior to the events of Interstellar. Fans can also explore the real science in Interstellar with the "Bite Size Science" site at InterstellarMovie.com/BiteSizeScience. The Science of Interstellar - Extended cut of the broadcast special. - Plotting an Interstellar Journey - Discusses the film's origins, influences and narrative designs. - Life on Cooper's Farm - Bringing Americana and the grounded nature of a farm to a sci-fi space movie. - The Dust - Learn how cast and crew avoided sand blindness, and see how to create, and clean up after, a catastrophic dust storm. - TARS and CASE - Designing and building these unique characters and how they were brought to life on set and in the film. - Cosmic Sounds - The concepts, process, and recording of Hans Zimmer's unforgettable score. - The Space Suits - A look at the design and build of the suits and helmets, and what it was like to wear them. - The Endurance - Explore this massive set with a guided tour by production designer Nathan Crowley. - Shooting in Iceland: Miller's Planet/Mann's Planet-Travel with the cast and crew to Iceland and see the challenges they faced in creating two vastly different worlds in one country. - The Ranger and the Lander - A look at the other two spaceships in the film. - Miniatures in Space - Marvel at the large-scale models used in the explosive docking sequence. - The Simulation of Zero-G - Discover the various methods that the filmmakers used to create a zero gravity environment. - Celestial Landmarks - Explore how the filmmakers used practical special effects informed by real scientific equations to give the illusion of real space travel for both the actors and the audience. - Across All Dimensions and Time - A look at the concept and design of the Tesseract, which incorporated a practical set rather than a green screen. - Final Thoughts - The cast and crew reflect back on their Interstellar experience.